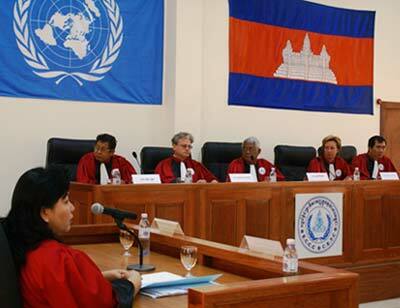 On 1 April, the Supreme Court Chamber issued an interim decision on part of Nuon Chea’s first request for additional evidence wherein it decided to initiate an investiga-tion aimed at establishing whether allegedly exculpatory video footage purportedly in the possession of Robert Lemkin and Thet Sambath – co-producers of documentary films En-emies of the People and One Day at Po Chrey – can be obtained in a reasonable amount of time and, if so, to procure it. To this end, the Supreme Court Chamber appointed two delegate judges to conduct the investigation on its behalf, and directed the Witness and Expert Support Unit of the ECCC to use its best efforts to contact Thet Sambath and Robert Lemkin. On 8 April, the Supreme Court Chamber denied requests by counsel in Cases 003 and 004 to intervene or act as amici curiae in Case 002/01 proceedings on the matter of the applicability of joint criminal enterprise as a mode of liability during the ECCC’s temporal jurisdiction. The Supreme Court Chamber considered that, because the Case 003 and 004 defence clearly have an interest in the outcome of the matter and could not offer any further submissions in addition to those already submitted to shed light on the matter, they could not act as amici curiae. As to their request for intervention, the Supreme Court Chamber found it to be unnecessary given that their interests are sufficiently protected by the plethora of sub-missions already on the matter. On 28 April 2015, following the nomination by the United Nations Secretary-General Ban Ki-moon, and the approval by the Supreme Council of the Magistracy, Mr. Olivier Beauvallet (France) has been appointed as new International Judge to serve in the Pre-Trial Chamber. Following this significant development and until the nomination of the other sitting international judge, the Pre-Trial Chamber is now ready again to deal with the pending appeals through a temporary engagement of its reserve international Judge Steven Bwana. During the month of April, the international side of the Office of the Co-Investigating Judges continued the investigations of Case Files 003 and 004. Six field missions took place, resulting in 19 PVs and five investigative action reports being drafted. Nine witnesses were interviewed at the ECCC premises. In Case 002/02, the Trial Chamber started the second trial topic, Worksites, on 19 May 2015. The Chamber will hear evidence regarding three worksites in the following order: 1st January Dam (Kompong Thom Province); Kampong Chhnang Airport (Kompong Chhnang Province); and Trapeang Thma Dam (Banteay Meanchey Province). The Chamber has organised the hearing of ten witnesses and Civil Parties for the 1st January Dam worksite. For full details, please see the ECCC monthly court report.